Medieval ladies had a lot going on. We sometimes might get bogged down by chores at home from the piles of laundry to all the cooking and cleaning. But for Medieval ladies, every chore we do today had many more steps. If you wanted to do laundry you had to make lye first. If you wanted to make a well-balanced super you had to stoke the oven, kill a chicken, gather the vegetables, and bake the bread yourself. In short, there wasn't much time in a middle ages woman's life to mess with her hair in front of the looking glass. You'll have plenty of time to love your look with these braids, no need to fuss. The braids fall long past the shoulder as was fashionable for the time. 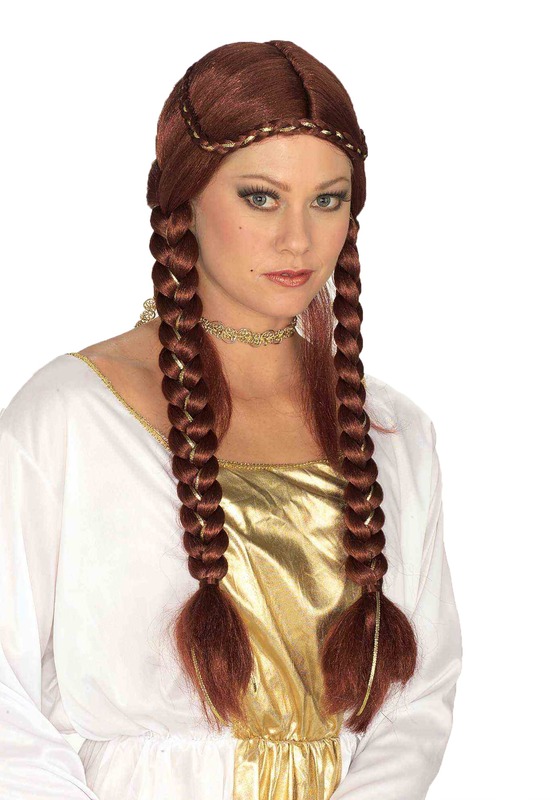 With gold ribbons integrated into both the circlet around the forehead and braids, both peasants and queens will love this look. With lovely looks like this, it's no wonder we come back to Renaissance and Medieval costumes again and again. Lucky for all of us, we have all sorts of costumes that can be topped off with this wig. So whether you're dressing up for a Renaissance Fair, play, or Halloween, you're sure to come up with a timeless look that'll make you feel like the queen o your realm.